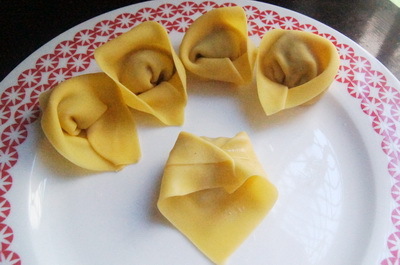 As you know, wonton is not authentic Bangladeshi food. 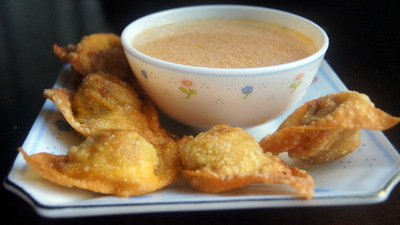 But fried wonton is very popular in Bangladesh. We (Bangladeshi people) just spice wonton up to match with our taste bud. 1. Heat pan with oil (1 and ½ tablespoon) and add prawn and soya sauce. 2. Cook 2 minutes and add cabbage and salt. Stir well. 3. When cabbage is half done add carrot, chilli and tasting salt. 4. Stir it and after 2 minutes remove it from heat. And keep aside. 5. For wrap mix all ingredients and water together and make hard dough. 6. Divide the dough into 8 balls and roll each ball using plain flour. 7. Make thin flat bread and cut into 4.5″ square. 8. Use whole dough to make square wrap. 9. Now stuff the wrap and fold like picture and to seal edge use water. 10. Heat the oil on medium heat and fry the wonton till it becomes golden brown. 11. 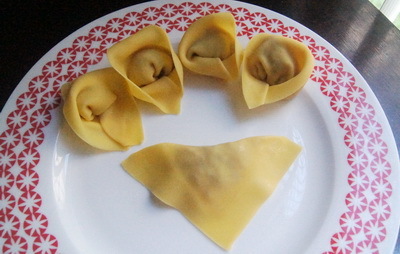 Serve fried wonton as a snack or with soup. 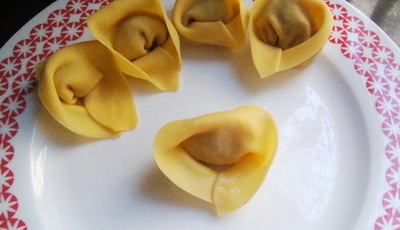 Tips: as you know tasting salt (Ajinomoto) is nomally used in wonton. In stead of tasting salt you can sugar which works fine to me. Nice pictures, this made my job easier. Great work Rownak. this looks really good. i wanted to try your egg korma recipe for so long, but our house never has coconut cream, and i am too lazy to go to the store and buy it myself. but i love this site, very organized, and pictures are mouthwatering. do you have your a cooking channel on youtube? Oshonkho Dhonobad for this recpy! This was so delicious. I tried it for Ramadhan, a BIG hit!! I made some that I have frozen for a couple days, the taste was the same. 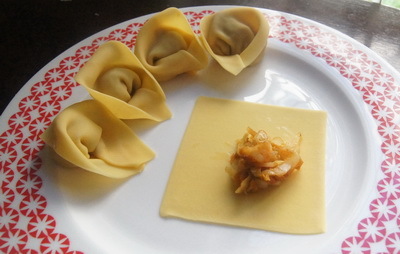 I learn wonton from someone but the wrapper was not good.Iwant to know in your process is the wrapper is as tasty and crispy as bangladeshi restaurant? And should I roll the wrapper very thinly? Hi! 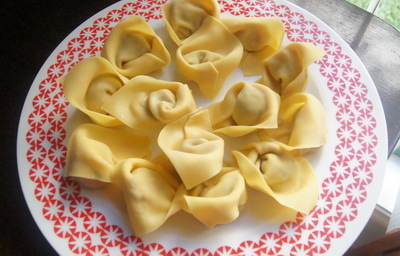 Wonton sheet needs to be roll thinly. Make once, u will know what the taste. Thanks. I like ur website a lot, very very organised, easy to understand. 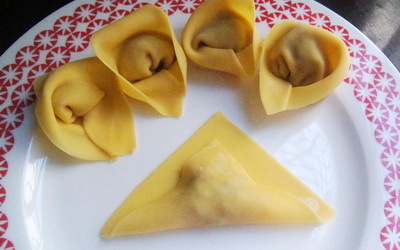 Would you please tell me- during wrapping of Wonton how the step 5 comes after step 4? if you just flip it and fold two edges then it will look it. if you make one or try with paper first . it is very easy and hard to go wrong.hope it will help. Thanks. Thanks for the recipe. how much oil do you need to fry wonton? Undoubtedly, this blog is fabulous!! I am Tamanna from Bangladesh. You are promoting our country through this effort. Wonderful. I like to cook. This will help me a lot. Inshallah talk to you more & more in the coming days. Thanks once again. Really ur website is awesome, I m starting loving it ,thank u for ur nice recipe….